The stitch count is not consistent throughout. The initial 11 stitches cast on increase to 18 by Row 5, and then decrease back to 11 at the end of Row 8. This looks great, even unblocked. 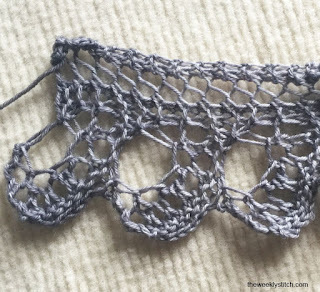 Can you add it to the bottom of a finished garment or only web completing something knit top down? Just Having Fun, you can sew the edging onto any finished item; I usually pick up along the top edge and make a crescent shawl.